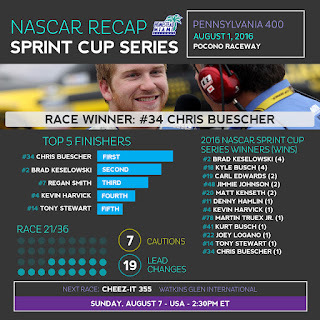 Sprint Cup Series rookie Chris Buescher won the 43rd Annual Pennsylvania 400 at the Pocono Raceway Monday afternoon. For Buescher, it is his first victory in 27 NASCAR Sprint Cup Series races, and it is also his first top-10 finish in 2016. 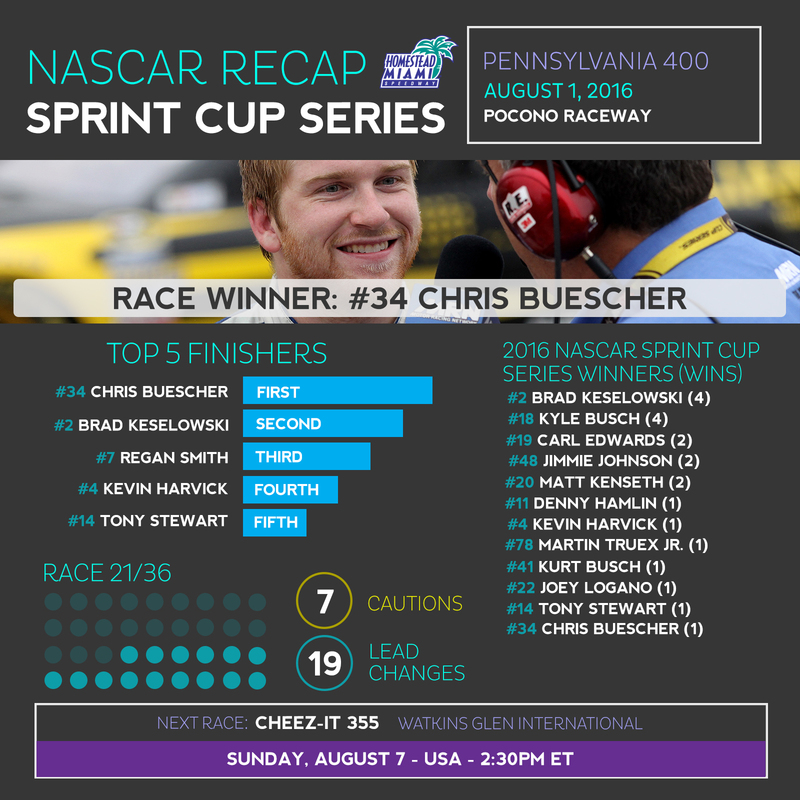 It is Buescher’s first victory and first top-10 finish in two races at Pocono Raceway. Buescher is the first rookie to win a NASCAR Sprint Cup Series race since Joey Logano’s victory at New Hampshire Speedway, June 28, 2009. Buescher's win is the second NASCAR Sprint Cup Series win for Front Row Motorsports - the first was with driver David Ragan at Talladega Superspeedway in 2013. Brad Keselowski (second) posted his seventh top-10 finish in 14 races at Pocono Raceway. It is his 13th top-10 finish in 2016. Regan Smith posted his best showing of the season finishing third at Pocono Raceway, giving him his first top-5 and second top-10 finish of the season. Kevin Harvick (fourth) posted his ninth top-5 and 17th top-10 finish this year. With Tony Stewart’s fifth place finish, he now has three top-5 showings in his last four races. Eleven drivers have qualified for the 2016 Chase for the NASCAR Sprint Cup, a list which includes Tony Stewart, Joey Logano, Kurt Busch, Carl Edwards, Kyle Busch, Denny Hamlin, Jimmie Johnson, Brad Keselowski, Kevin Harvick, Matt Kenseth and Martin Truex Jr., all of who have taken checkered flags this year. As a result of his victory, Chris Buescher would also qualify so long as he finishes in the top-30 in points after the season’s 26 regular season races. Buescher currently sits in the 31st spot with 281 points, six behind David Ragan (287), who is in 30th, and nine points in front of 32nd place Regan Smith (272 points). The Chase culminates with the Ford EcoBoost 400 championship race on November 20 at Homestead-Miami Speedway. As a result of Chris Buescher’s rookie status, he has not competed in a Sprint Cup Series race at Homestead-Miami Speedway. However, Buescher celebrated his 2015 XFINITY Series championship at Homestead-Miami Speedway following the Ford EcoBoost 300 last November. Starting this year, the XFINITY and Camping World Truck Series will feature championship races at Homestead-Miami Speedway on November 19 (NXS) and November 18 (NCWTS). Four drivers will compete amongst a full field for their respective title. The following are race recaps from Saturday’s XFINITY Series race at Iowa Speedway and the Camping World Truck Series race at Pocono Raceway. Erik Jones won the 8th Annual U.S. Cellular 250 XFINITY Series race at Iowa Speedway Saturday. It is his 5th victory in 45 NASCAR XFINITY Series races. It is his third victory and 12th top-10 finish in 2016. It is his first victory and third top-10 finish in four races at Iowa Speedway. Elliott Sadler leads the point standings by 14 points over Daniel Suarez.Through 19 races this season in the XFINITY Series, Erik Jones, Daniel Suarez and Elliott Sadler have qualified for the 2016 XFINITY Series Chase as a result of their victories. Kyle Busch, Kyle Larson, Austin Dillon, Chase Elliott, Dale Earnhardt Jr. and Denny Hamlin have also won an XFINITY Series race this season but are ineligible for the XFINITY Series Chase due to their full-time status in the Sprint Cup Series. Sam Hornish Jr. is also ineligible because he is not a full-time driver in the XFINITY Series. William Byron won the 7th Annual Pocono Mountains 150, his fifth victory in 13 NASCAR Camping World Truck Series races. It is his fifth victory and seventh top-10 finish in 2016. It is his first victory and first top-10 finish at Pocono Raceway. William Byron leads the point standings by 25 points over Matt Crafton. Through 12 races this season in the Camping World Truck Series, Christopher Bell, William Byron, Matt Crafton, John Hunter Nemechek and Johnny Sauter have qualified for the 2016 Camping World Truck Series Chase as a result of their victories. Kyle Busch and Kyle Larson have also won a Camping World Truck Series race this season but are ineligible for the Camping World Truck Series Chase due to their full-time status in the Sprint Cup Series.